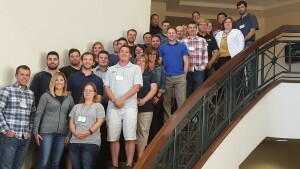 CAP Services’ Kitty Johnson completes lending training – CAP Services Inc.
CAP Services’ Business Development Coordinator Kitty Johnson, second from right, stands with the graduates of Wisconsin Bankers Association’s recent Intro to Commercial Lending course in De Pere. Kitty Johnson, a Business Development Coordinator at CAP Services, successfully completed an Intro to Commercial Lending course held Sept. 7-9 at St. Norbert College in De Pere. Sponsored by the Wisconsin Bankers Association, the curriculum is designed to provide bankers and other lenders with a basic understanding of the principles and concepts of commercial lending. The faculty is comprised of bankers who are considered authorities in their field. CAP’s business development program provides services to start-up and expanding businesses, including business plan development, financial analysis, finance packaging that can include working capital and gap financing, marketing plans, and one on one technical assistance. The services are provided free to low-income entrepreneurs or to businesses that create living wage jobs for low-income individuals. Since 1988, CAP has assisted with the creation or expansion of more than 400 businesses. In the past five years, CAP supported the development of 64 new businesses that resulted in the creation of 116 living-wage jobs in central and eastern Wisconsin. Johnson’s territory covers Outagamie and Waupaca counties. Persons interested in CAP’s business development services there should contact Johnson at 920-209-1384 or kjohnson@capmail.org. CAP Services’ business development program also serves Marquette, Portage, Waushara and Wood counties.